John Kemp : Where has the oil gone? 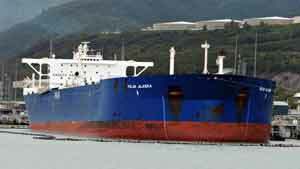 Polar is the marine shipping unit of ConocoPhillips. 500,000 barrel storage tanks are seen in the distance. Global oil production exceeded consumption by just over 1 billion barrels in 2014/15, according to the International Energy Agency (IEA). That leaves 550 million "missing barrels" unaccounted for, apparently produced but not consumed and not visible in the inventory statistics ("Oil Market Report", IEA, Feb. 2016). Missing barrels are recorded in the "miscellaneous to balance" line of the IEA's monthly Oil Market Report as the difference between production, consumption and reported stock changes. Missing barrels have been a feature of IEA statistics since the 1970s ("International Energy Agency: How the Agency Prepares its World Oil Market Statistics", U.S. General Accounting Office, 1999). Over time, errors have occurred in both directions, and have ranged up to 1 million or even 2 million barrels per day ( tmsnrt.rs/1pvIBjQ ). Critics accused the IEA of over-estimating supply, under-estimating demand, contributing to perception of a glut, depressing prices, and causing unnecessary hardship to the oil industry ("There Are No Missing Barrels", Simmons, 1999). Senator Pete Domenici, chairman of the U.S. Senate Budget Committee, asked the General Accounting Office to investigate the IEA's statistics and the question of missing barrels. In a report published in May 1999, GAO concluded "missing barrels are not a new condition, and the amount and direction of missing barrels have fluctuated over time". "At any point in time, the historical oil supply and demand as well as the stock data reported by IEA could be overstated or understated by an unknown magnitude." It was not possible to "quantify how much of the missing barrels are due to statistical limitations and how much are the result of physical oil storage in unreported stocks". In 1997/98 episode, the IEA concluded most of the missing barrels went into non-OECD storage and uncounted OECD inventories ("Oil Market Report", IEA, June 1999). In its "Medium-Term Oil Market Report", published last month, the IEA predicted consumption would not exceed supply on a full-year basis until 2018. With the oil market expected to remain in surplus throughout 2016 and "already awash in oil" the IEA has said that "it is very hard to see how oil prices can rise significantly in the short term." But to the extent the missing barrels are the result of over-estimating supply and under-estimating demand, or have been absorbed into China's strategic stocks, the overhang could clear more quickly. Following the 1997/98 episode, the missing barrels that accumulated in unreported non-OECD storage were drawn down in 1999, according to the IEA ("Oil Market Report", IEA, Dec 1999). In December 1999, the IEA wrote: "The weight of (the) evidence is that the missing barrels did exist and that they have now returned to the market." "The return was triggered by the reversal in the shape of the forward price curve and the need for additional barrels following OPEC's effective production limitation" which began in March 1999. John Kemp is a Reuters market analyst. The views expressed are his own. Petroleumworld does not necessarily share these views. Editing by David Evans. Editor's Note: This commentary was originally published by Reuters on March. 8, 2016. Petroleumworld reprint this article in the interest of our readers.